In January 2012, I started Paper and Salt. The past year brought a lot of new things: new jobs, new friends, new recipes, new books, new travels. But discussing authors’ favorite recipes here has been the best ‘new’ thing of that New Year, and (to mix up all my holidays at once) I’m thankful. 1. Experiment. The best way to develop our own style is to dabble in others’ for a while. If you’re clinging to a sentence or a favorite ingredient, take a moment to let go. See how it feels. 2. Have patience. Taking pictures of food is even more about patience than it is a keen eye or a newfangled camera. You will move things around, making the most trifling of changes (This napkin here? Or here? Or … ? ), ad infinitum, until your food gets cold and all the dishes you own are stacked in the sink, discarded after their short-lived modeling careers. And chances are, you’ll pick the first photo you took. Your patience will be what keeps you from throwing your camera across the room. 3. Be inspired. Despite the hours that go into cooking, writing, editing and photographing, the community of food bloggers still make time in the day to be extremely generous, and I’m indebted to many of them. I’ve updated the links section of this blog, if you’re ever in need of some delicious inspiration. 4. Persevere. Posts about baked goods will always, always garner more excitement and stomach rumblings than posts about salad. But never stop writing about salad, if that salad has some poetry in it. 5. Be brave. Writing, just the pure process of it, can be incredibly hard. But harder still is putting that writing out into the world, when you know it’s not perfect. You let it out of of your safe little nest of thought, unchaperoned and a bit underdeveloped, and hope it survives. But sometimes it does one better – sometimes it takes flight. The New Yorker: Few things make me feel as wistful for Old New York as much as reading The Age of Innocence. Named for the famed Manhattan food shop, The Silver Palate Cookbook isn’t turn-of-the-century old, but it’s become just as much of a classic for food lovers – the book that brought raspberry vinaigrette to kitchens everywhere. The Midday Snacker: Frank O’Hara wrote Lunch Poems on his breaks from work, roaming around Manhattan’s streets, and they’re best digested the same way: over a quick sandwich in a diner at noon, or on a midday picnic in the park. Finish your lunch with a bite-size treat from One Girl Cookies, with recipes from their award-winning shop in Brooklyn. The pumpkin whoopie pies might wind up being your entire lunch, if you’re not careful. The Adventurer: As someone with a constant need to analyze, I was reminded by reading The Wind-Up Bird Chronicle that some things are not meant to be understood, but absorbed. 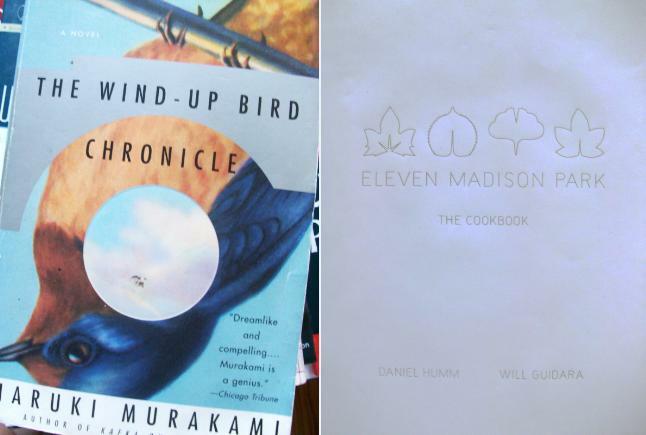 When I first saw Eleven Madison Park: The Cookbook, I had the same reaction as reading Murakami for the first time: How did they do that? Apologies to those abroad, but to save myself the postage, only U.S. residents are eligible to win. But you can win multiple prizes, because why not? The giveaway will end on Friday, January 25. Enjoy! Congrats on making it a year! I’ve enjoyed all your posts and can’t wait to see what 2013 brings. I do love how you bring books, authors and food together! I always think it’s kind of funny when, after I’ve finished certain books, the only thing I can remember is the description of the food the characters ate. Now, I think I might have to try to make some of those dishes I’ve been reading about! Your blog has quickly become one of my very favorites—I can’t imagine the about of time that goes in to making each post as information dense, yet utterly readable as I find them to be. Cheers to another year! I only discovered your blog recently, but as a lover of both food and books, it is rapidly becoming a favorite. Love your website. Made Truman Capote’s Raspberry and Chocolate Pudding for my Book Club….a big hit! Thanks, Julie! I’m so glad it went well – I’m waiting until summer so I can make it again! Is it only a year, feels like I’ve been following you longer than a year. My blog is also one year old … we should celebrate. Yes I get all the frustrations about shooting food, and your best meal gets cold in the process. I’ve been meaning to send you this link http://www.donmarquis.org/beans.htm in case Don Marquis author of Archie & Mehitabel is not on your radar. Not sure I’d want to eat his favourite meal but then who am I to judge. I write a lot about salads! PS I’ll be in New York 1 Feb for 4 days my kids are taking me there for my big birthday present! How lucky am I? Congratulations on your own blog birthday, Linda! I love recipes like this – more for their poetry than for the finished product, probably. Thanks for passing it along. Congrats on your first year! I love that your blog combines my love of food and books. I found your blog last fall and do so enjoy it! A favorite! And how I would like to win that book Lunch Poems!!! Enough I will go sign up on Facebook too. Thanks for two chances for me! I’ve really enjoyed following your posts over the past few months! And I love the combination you’ve created of Lunch Poems & One Girl Cookies. Here’s hoping for another great year! The literary food blog is a fantastic idea and you’ve done an amazing job with it. I learn so much reading here. Thank you! I’ve loved this blog ever since I’ve discovered it. I think it’s one of the best food blogs out there. Congrats on a great year, and here’s looking forward to many more. I’m taking myself out of the running because I have all these books, save “One Girl Cookies”, but I had to chime in and say I love how you mix recipes and literature, you nourish the soul, Nicole! Congratulations! I’ve enjoyed the first year and am looking forward to many more – thanks! I already like you on Facebook. A truly creative blog! Thanks! Congratulations on your first year! Here’s to many more! I love Paper and Salt and have used two of your recipes for company. Thank you for this interest. I cook a lot and love knowing the history of food items. Happy First Year Birthday! Been reading along and following you on FB for awhile, enjoying every nibble and sip. Thanks for the great inspiration :). Happy Birthday! Wishing many happy returns and delicious dishes ahead! Congratulations on making it a year! I am new to your posts, and I find them inspirational and informational. Thank you for all you do…. It’s been a year already? How time flies! I’ve very much enjoyed the last year of posts and look forward to more in 2013. This post is useful to other types of writers as well. Thank you for sharing. And thanks for the lovely recipes. Congratulations and thanks for writing such thoughtful, interesting and well researched posts! How incredibly generous! Thank you for the giveaway. I wait for each and every post from Paper & Salt. Love your blog so much. I love this blog; what a great combination of books! 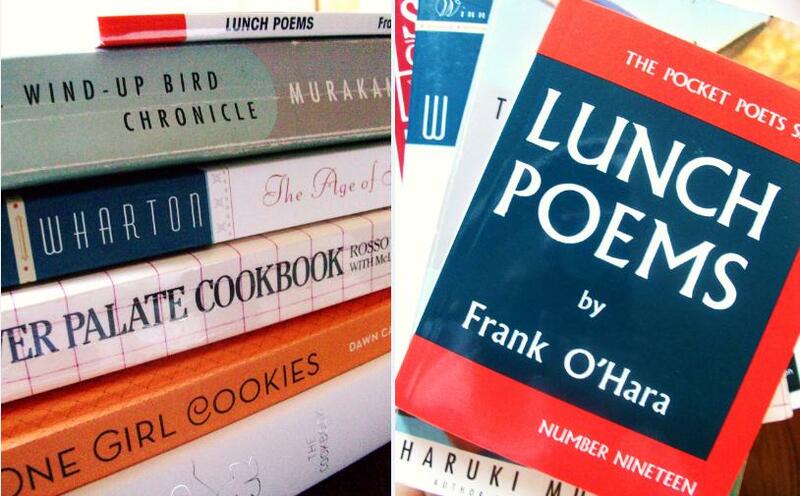 I would especially love to win the Age of Innocence combo or the Lunch Poems. I’ve shared the giveaway on facebook, too! 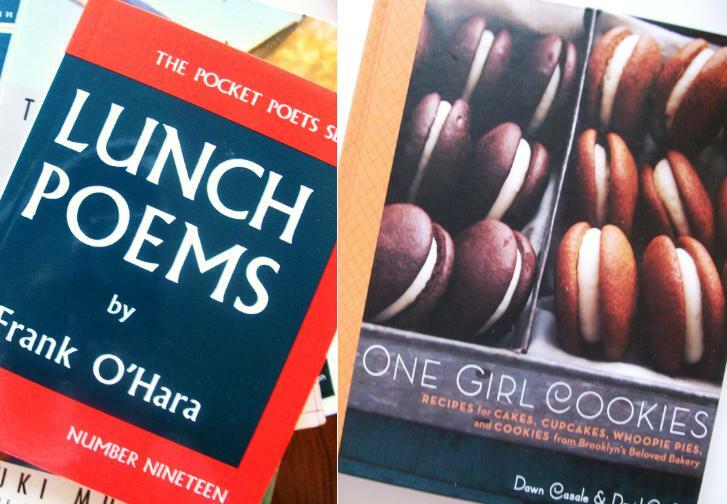 Oh, I’d love to win the Lunch Poems/One Girl Cookies duo! Off to like you on Facebook and tweet this link. These are great things to keep in mind! Thanks for the post and for the giveaway. you’re my hero. but you already knew that. I’m so proud of you! i’ve been recommending your blog from the beginning. it’s lovely. and it’s lovely of you to continue it. thank you! Happy blog-birthday! I stumbled on your writing from somewhere-I can’t think where, now, but I’m glad I did, anyhow, as your posts are always fun and full of interesting bookish things. Thanks for sharing your writing! I just hosted my 21st birthday party (A Wilde Night) using your blog for inspiration! Thank you for the wonderful idea! This sounds like so much fun – and a great excuse to serve a lot of champagne! I might have to steal it when my birthday rolls around! Love these book pairings and your blog! Really love what you do on this blog. I always find the way you couple literary insights with specific dishes quite interesting. What’ll it be today? Thanks for the beautiful work. Of course I’d LOVE to be entered into the contest. I liked you on Facebook a long time ago. In Canada, so I can’t win any prizes, but I just wanted to say that I’ve really enjoyed your blog this year. It’s always interesting and inspiring. And appetizing! Your blog has become one that I check every day. Looking forward to what the new year brings! Thank you for the words of wisdom from a fellow blogger! Congratulations on your first anniversary. Here’s wishing you many more. Keep up the great work. I finally “liked” you on FB, but I’ll leave a message here too. I am hoping that I win the Murakami book! Looking forward to many new books and recipes in the year ahead! i love your site. i’m a foodie and a writer/reader. i look forward to your posts!